Last year, high school student Michelle Nguyen had all but given up her hope of becoming an engineer. A Senior at Mission High School in San Francisco (which did not offer a computer science class), she thought she had to be smarter, more privileged, and be a male to be successful in computer science. “I thought I had to be a guy to be an engineer,” she told me as she was siting in the Square offices nearby her home in the Tenderloin, only days away from taking the AP Computer Science test. But Nguyen still held some small hope for being part of this world — she would read publications online that gave her an inside view into technology. She was reading TechCrunch last fall when she came across an article about payments company Square’s High School Code Camp, a 9-month long program that taught students from local San Francisco high schools how to program in Java; and gave them the opportunity to take the AP CS exam in May. “It was easy to learn how to code. I love the instant feedback,” she told me. Nguyen, who applied and attended the class along with 7 other young women in high school, just graduated, and was accepted into UC Santa Cruz to study computer science. “I knew I had to look beyond what I was offered at [high] school to get what I wanted,” she told me. Susan Tham, whose school Raoul Wallenberg Traditional High School ,did offer an AP computer science course soon found herself to be the only girl left standing. Out of a group of 30 or so students, only 4 girls enrolled in the AP Computer Science class at her school, and the three other girls quickly quit the class because of the challenge and intimidation. Tham herself just stayed in the class not because she had dreams of being a programmer but because she actually enjoyed coding and was good at it. In fact, she taught herself how to code initially by taking classes on Udacity. “It was easy to learn how to code. I love the instant feedback,” she told me. Her CS teacher saw her potential and recommended she apply to Square’s program, though Tham says she was so surprised when she was admitted — she never thought she would have been chosen. For Tham, Code Camp taught her that she could actually make a career out of being a software engineer. And that this wouldn’t mean working in a tan cubicle for a boring company. She’ll be attending UC Irvine this fall for Computer Science. Through my conversations with the girls, it became evident that part of what made Square’s Code Camp so successful is that it gives these girls real-world exposure to what being an engineer at a startup looks like. Everything that they had ever known about working in tech came from movies and TV — a boring sea of cubicles, not the wide open spaces and collaborative environments favored by so many Silicon Valley startups now. “It was really cool to see that I could be working in an open space, not just in a cubicle, dreading my work,” said Nguyen. The students met twice a week from October through May, for two hours at a time at Square’s headquarters. Classes would begin with a short lecture and then dove straight into hands-on coding work. Every fourth week was Hack Week, where they applied the concepts they learned to build a working demo of a feature or product. The computer science curriculum was created (and taught) by Square engineers. And non-technical Square employees were given the chance to pair up with these students and learn how to code alongside them. Teodora Caneva, a senior at Balboa High School, and a Code Camp participant, started learning about coding on Codacademy but was intimidated about taking a computer science course at school because “it was all boys.” Her teacher knew of the Square initiative and encouraged her to apply. Like Nguyen and Tham, she will also be studying computer science at SF State this Fall. Vanessa Slavich, who leads Square’s talent programs and the Code Camp, explains that Square wanted to tackle the problem of getting more women into engineering, and initially started with a similar program at the college level, which is a four-day immersion program developed to inspire women engineering students to pursue a career in computer science after college. But she quickly realized that there also needed to be something at the high school level that encouraged girls to go into college with an interest in CS. But the AP Computer Science class, which is often the gateway for both men and women to go into CS in college, is only offered at a handful of schools in the Bay Area. In fact Sarah Friar, CFO of Square who also has a masters in engineering, shared some staggering statistics: only 5 percent of U.S. high schools offer AP Computer Science, and as of 2011, 19 percent number of the students who take that class are women. Those women who do take the AP Comp Sci class are 8 times more likely to go on and major in computer science in college. So the goal of taking AP exam, and the longer time frame of learning (8 months), helped give Square’s high school program structure. Because the class was collaborative and interactive, the learning process was more accessible, less intimidating and actually fun, she explains. All the girls were paired with a mentor at Square who helped them think through problems, guide them in their education, and even college plans. Square also held events with women in the industry where the girls could meet other women and role models who had pursued engineering as a career. “When people say engineer, I think of men,” Caneva told me. Slavich says that part of the education is also around making these girls aware of that misconception, and assuring them that they can succeed in what is, for now, a male-dominated world. One of Square’s software engineers, Kat Hawthorne, helped design the curriculum of the program, and actually graduated from the first Square College Code Camp for women, said she wished she had been able to attend this program in high school. She didn’t start coding until her junior year of college, but once she started she was hooked. She found out about the Code Camp online, and after attending knew she wanted to be an engineer. Hawthorne applied for a job at Square right out of college, and is now on the engineering team working on Square Market. Beyond just being prepared to take the test, these girls actually learned to expand their coding skills, and create. Tham says that she learned about pseudocode, and she was able to figure out how to actually organize her code. Nguyen created her own program, a game, and derived confidence from the fact that she could actually create something herself. Square’s code camp isn’t the only program to inspire High School girls to begin to code. Girls Who Code, Girl Develop It, and others are attempting to give young women the opportunity to learn and discover the art and science of coding. There’s no doubt that we need more initiatives, especially at the local level. 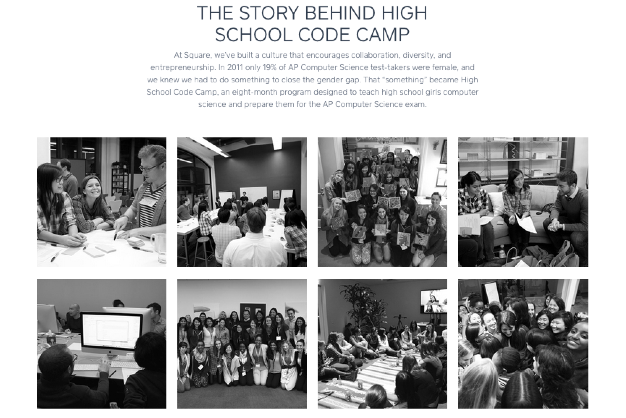 Square is tackling the issue in SF, and plans to have a another class next year, but the hope is that technology companies in SF, and other cities launch their how high school code camps for young women. One day, gender will be a non-factor in career choice. But we are still a far way from that. And until that day, we need more programs like Square’s Code Camp and Girls Who Code. I began this piece with Nguyen’s inspiring story, and I will leave you with another inspiring story from a past generation. In 1967, 25-year-old Damyanti Gupta immigrated to Detroit with one goal—to be an Engineer at Ford Motor Company. But there were no female engineers at the company. When a hiring executive flatly told her that “we don’t have any women on staff”, she quickly replied “if you don’t hire me, then you won’t have that benefit.” A few weeks later, Damyanti, who is my mother-in-law, was hired as Ford’s first-ever female engineer. She went on to stay at Ford for 35 years until she retired. Now that I have a daughter, I know she will find motivation in her grandmother’s story, but I am also hopeful that she will grow up hearing many more stories from young women like Nguyen, Tham, and Caneva, who have been so courageous to share their own fears in order to help inspire others to take their journey.